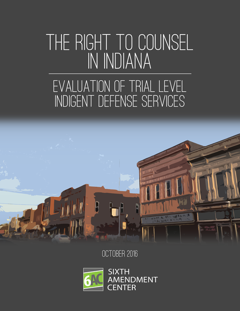 FULL REPORT (1.6 MB, PDF file): Sixth Amendment Center, The Right to Counsel in Indiana: Evaluation of Trial Level Indigent Defense Services (October 2016). EXECUTIVE SUMMARY ONLY (448 KB, PDF file): Sixth Amendment Center, The Right to Counsel in Indiana: Evaluation of Trial Level Indigent Defense Services (October 2016). In Indiana, counties and cities are responsible for funding and administering all indigent defense services. Indiana counties (but not cities) may, if they so choose, receive a partial reimbursement from the state for their indigent defense costs – excluding misdemeanors, for which the state provides no reimbursement at all — in exchange for meeting standards set by the Indiana Public Defender Commission (IPDC). However, counties are also free to forgo state money and avoid state oversight. What many Indiana counties have realized is that they can contract with private counsel on a flat fee basis for an unlimited number of cases for less money than it would cost to comply with state standards (even factoring in the state reimbursement). Thirty-seven of Indiana’s 92 counties (40%) choose not to participate in the state’s reimbursement program as of June 30, 2015, more than 20 years after the state reimbursement program began. This hybrid system for right to counsel services, known as the “Indiana Model,” where lawyers for some indigent defendants are required to meet standards conducive to constitutional effectiveness while lawyers for other defendants are not, both institutionalizes and legitimizes counties’ choices to not fulfill the minimum parameters of effective representation required by the U.S. and Indiana constitutions. • in those capital cases for which counties do not seek state reimbursement. Even in those counties that do participate in the state reimbursement programs and are subject to the IPDC standards, Indiana has only limited capacity to ensure that its constitutional obligations are met. These are among the Sixth Amendment Center’s findings from a statewide evaluation of trial level right to counsel services in Indiana. The 6AC’s report documenting these deficiencies, The Right to Counsel in Indiana: An Assessment of Trial Level Indigent Defense Services, released October 24, 2016, is the culmination of a year-long study conducted on behalf of the Indiana Indigent Defense Study Advisory Group. The 6AC conducted courtroom observations, interviewed criminal justice stakeholders, and reviewed data in eight representative counties and from the state’s three state-level agencies related to the provision of indigent defense. Misdemeanors matter. Although a misdemeanor conviction carries less incarceration time than a felony, the collateral consequences can be just as severe. Going to jail for even a few days may result in a person losing professional licenses, being excluded from public housing and student loan eligibility, or even being deported. For most people, misdemeanor courts are the place they will have their initial, and hopefully only, contact with the criminal justice system, yet Indiana has no mechanism to ensure that indigent misdemeanor defendants receive effective assistance of counsel. Nearly one-third of Indiana’s people live in one of the thirty-seven counties that, as of June 30, 2015, do not participate in the state’s reimbursement program. In addition, the Lake County juvenile and county division courts do not participate. For indigent defendants charged with felonies or juvenile delinquency in these counties and courts, Indiana has no mechanism to ensure that its constitutional obligation to provide them with effective representation is met at trial or on direct appeal. The IPDC has no authority whatsoever over the representation of indigent people in these courts, and the courts and public defense attorneys do not have to abide by the IPDC’s standards nor report to the IPDC on their indigent defense representation. In other words, one out of every three indigent Indiana residents runs the risk of receiving counsel whom the state cannot ensure will provide effective representation. Ostensibly, Indiana has in place a mechanism to provide effective oversight of indigent defense services in most of the courts in the 55 counties that, as of June 30, 2015, do seek reimbursement from, and therefore in theory comply with the standards set by, the IPDC. Further, Indiana’s reimbursement program is open to all of the state’s 92 counties for everything except misdemeanors. Yet, two things have hindered the effectiveness of that program. First, state funding for reimbursements to the participating counties has not always kept pace with the expressed goal of reimbursing 40% of indigent defense costs other than for misdemeanors. For example, reimbursements to counties for non-capital representation dropped to a low of 18.3% in 2006. The unreliability of reimbursements has been at least the partial cause of a number of counties leaving the program and the decisions by other counties not to participate to begin with. Second, for most of its history, the IPDC operated with only a single full-time staff member to oversee compliance with the organization’s standards in the participating counties and courts. In 2014, a second full-time staff position was added. The state is obligated to ensure effective representation to the indigent accused facing a potential loss of liberty in all of its five appellate districts, 91 circuit courts, 177 superior courts, and 67 city and town courts. No two people, no matter how talented, could ever possibly ensure compliance with standards in so many jurisdictions. Of course, the lack of state oversight of indigent defense services is not by itself outcome-determinative. That is, the absence of institutionalized statewide oversight does not mean that all right to counsel services provided by all county and municipal governments are constitutionally inadequate. But it does mean that Indiana has no idea whether its Fourteenth Amendment obligation to provide competent Sixth Amendment services is being fulfilled. The 6AC determined that the state of Indiana’s constitutional obligation to provide counsel at all critical stages of a criminal proceeding is not consistently met at the local level. Some courts encourage defendants to negotiate directly with prosecutors before being appointed counsel, and others accept uncounselled pleas at initial hearings and/or use non-uniform indigency standards to deny counsel to defendants who would otherwise qualify in another county. Indiana does not consistently require indigent defense attorneys to have specific qualifications necessary to handle cases of varying severity or to have the training needed to handle specific types of non-capital cases. The public defense systems in many Indiana counties have undue judicial interference, undue political interference, flat-fee contracts, or all three, that produce conflicts between the lawyer’s self-interest and the defendant’s right to effective representation. These conflicts result in public defense attorneys throughout Indiana carrying excessive caseloads and spending insufficient time on their appointed cases. The Sixth Amendment right to counsel is a right held by each individual. It does not matter if a government provides effective representation to the first co-defendant, if not to the second; or to people charged with felony offenses, if not to those charged with misdemeanors; or to those charged in certain courts, if not to those charged in other courts. It does not matter even if government generally provides adequate counsel to most people. If indigent defense services are structured in a way that actually denies counsel to defendants, or constructively gives the accused a lawyer in name only because the lawyer has too many cases or operates under too many financial conflicts to be effective, the system itself is constitutionally deficient. Unfortunately, this is an apt description of the right to counsel in Indiana today. The following links allow readers to take a closer look at the data that drives the findings and recommendations contained in our full report. The Sixth Amendment Center (6AC) thanks the National Association of Criminal Defense Lawyers (NACDL) for commissioning this report as a part of its public defense reform program. NACDL acknowledges the support of Koch Industries, whose generous funding helps to support NACDL’s public defense work. That work is also supported by the Foundation for Criminal Justice (FCJ). The Right to Counsel in Indiana: An Assessment of Trial Level Indigent Defense Services (October 2016), is available from the Sixth Amendment Center in electronic format only.